The state of Indiana sets aside funding for tax credits for individuals and businesses that wish to support scholarships for eligible students attending qualified private schools. Donors receive a state tax credit equal to fifty-percent (50%) of the amount donated. There is no limit on the amount of tax credits an individual or business can receive. Please consult with a tax professional regarding your unique circumstances because federal deductions vary. 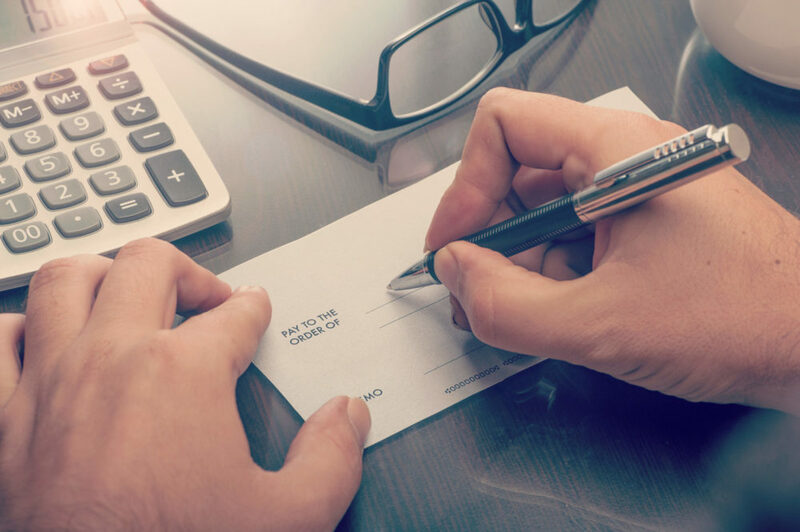 Recent proposed IRS rules change how SGO donations may be claimed on the federal tax return. Below you will find some information and some general examples. Every situation is unique, and we encourage you to talk to your tax adviser for a full understanding of your tax benefits. The proposed rule change was published in the Federal Register on 8/27/2018 and now enters a 45-day public comment period. The effective date in the proposed rule impacts donations made after 8/27/2018. Everyone who itemizes and gives after 8/28 should include 50% of their SGO gift as a charitable donation. For donors who have less than $10,000 in state and local income, sales and property taxes (SALT), your charitable deduction is going to be offset by state tax savings and you won't see a federal tax savings in the long run. 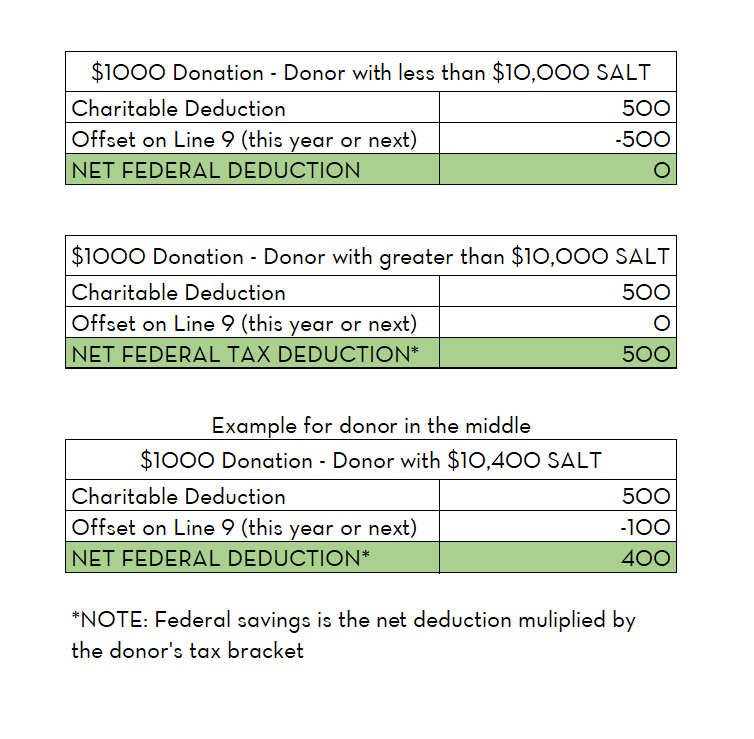 For donors who have more than $10,000 in SALT to deduct, you will see a federal tax savings and the amount will vary depending on your tax bracket (for people in this group, the federal benefit will be the same as it was in 2017 and previous years). All taxpayers will continue to receive a 50% state tax credit as long as credits are available for their gifts made to Indiana SGOs. SGO donors who do not itemize on their federal tax return do not receive additional benefits for their SGO gift on their federal return. Starting in 2018, taxpayers will be limited to $10,000 in itemized deductions for state and local income, sales and property taxes (SALT). Because donors who receive a tax credit ultimately pay less in state taxes, this provision is significant for SGO donors. SGO donors who have less than $10,000 in SALT deductions will be impacted differently than those who have more than $10,000 in SALT deductions. The charts below illustrate the potential federal tax impact for donations made on or after 8/28/2018. The “offset” amount is due to less state tax being paid when the credit is claimed. These are only illustrations; please consult a tax adviser for specific applications. Please consult a tax professional about your specific tax situation!